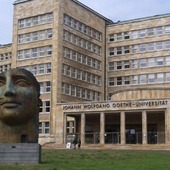 Johann Wolfgang Goethe University of Frankfurt is among the ten largest universities in Germany. The university is named after Johan Wolfgang von Goethe who was born in Frankfurt, the erudite famous for his exclusive contributions to literature, science, and philosophy. Founded in 1914 on private costs, University of Frankfurt, nevertheless, became one of the first "public universities" and further its history developed as a history of one of the most open for general public universities. At the moment the University of Frankfurt is the only university in Germany which is completely funded by the state.